Edaville USA is a family fun amusement park located in South Carver, MA. 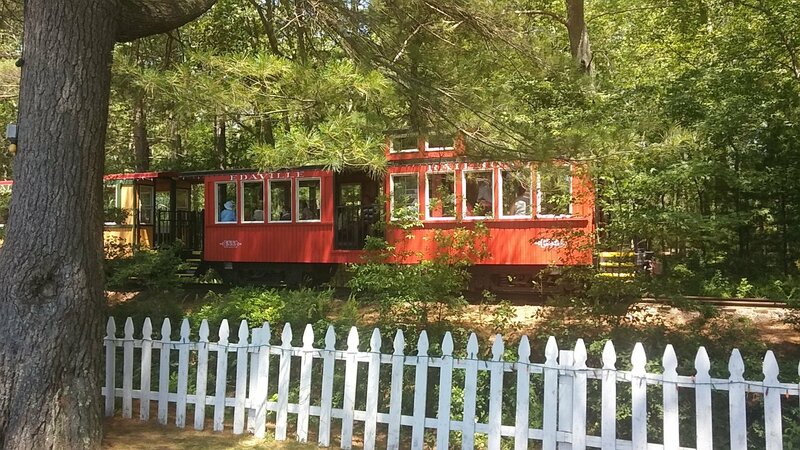 The park features train rides through picturesque cranberry bogs, vintage amusement rides, indoor and outdoor play spaces and new attractions such as Dinoland. 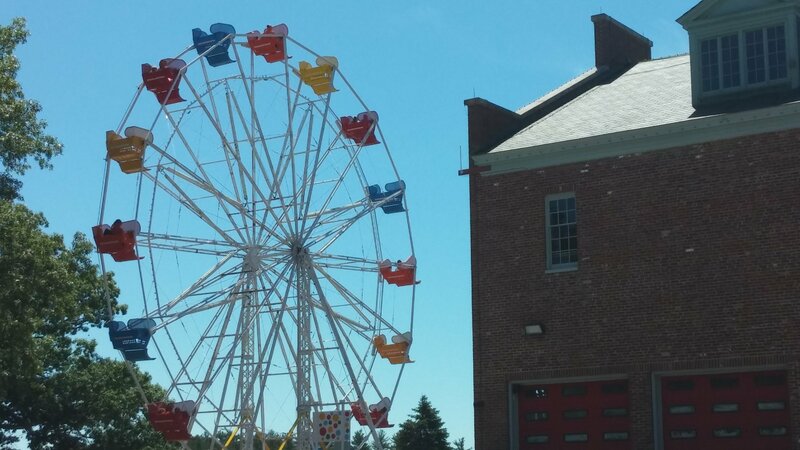 In addition to its amusement rides and indoor and outdoor play spaces, Edaville holds different events every weekend. 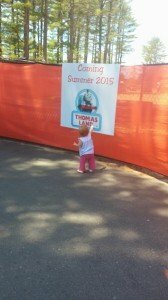 Event themes include Thomas the Train, Princesses and Superheroes, Pirates, Hello Kitty and more. You can see their schedule of summer events here. All events are included in the price of admission. 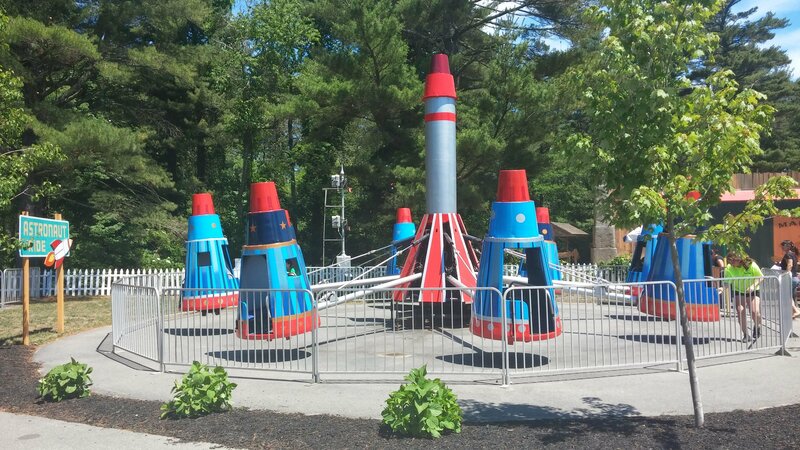 In my opinion Edaville USA is best suited for young children. 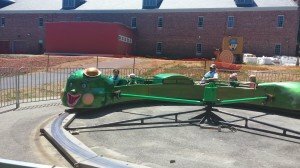 Children who are preschool age through early elementary school age will be able to go on most of the rides and will appreciate Edaville’s themed weekends. Admission Price: General admission for 2014 is $20 per person. This price includes admission to Dinoland. Children under the age of 2 are admitted for free. Construction: I want to point out that Edaville is under construction. Edaville is adding a bunch of new attractions to include Thomas Land coming in Summer 2015. 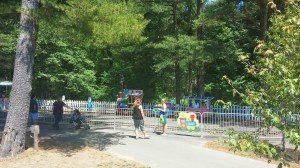 The construction didn’t bother me or have any negative impact on my or my children’s enjoyment. That said, I do want to highlight this so you are all aware. 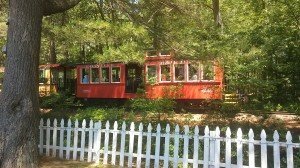 Train: Edaville has a large train with spacious cars to sit in and large windows that the kids can peep out of. The park was not crowded when we went. 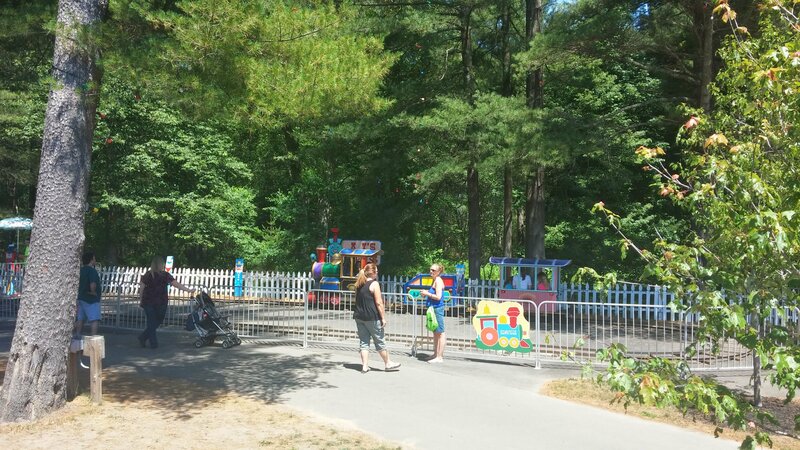 I cannot speak to how manageable or not the train would be at a big event like “A Day Out With Thomas.” That said, I thought the train and train ride were quaint and provided a nice break from amusement park rides. Rides: There are about 20 rides at Edaville USA. 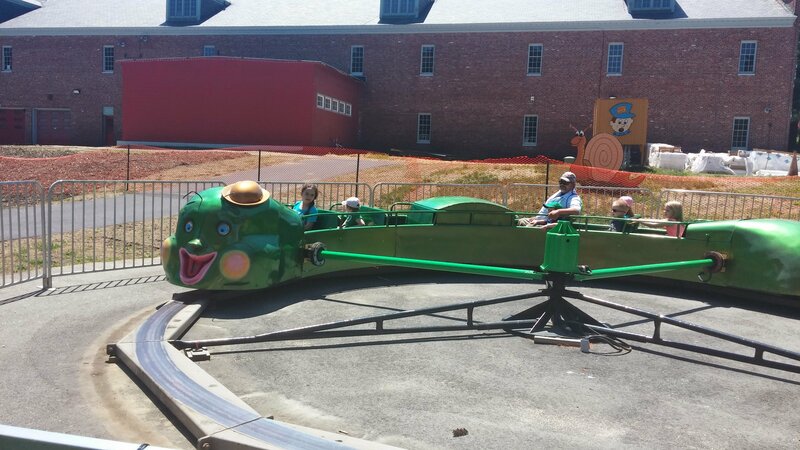 In my opinion, most rides are best suited for children ages 10 and under. 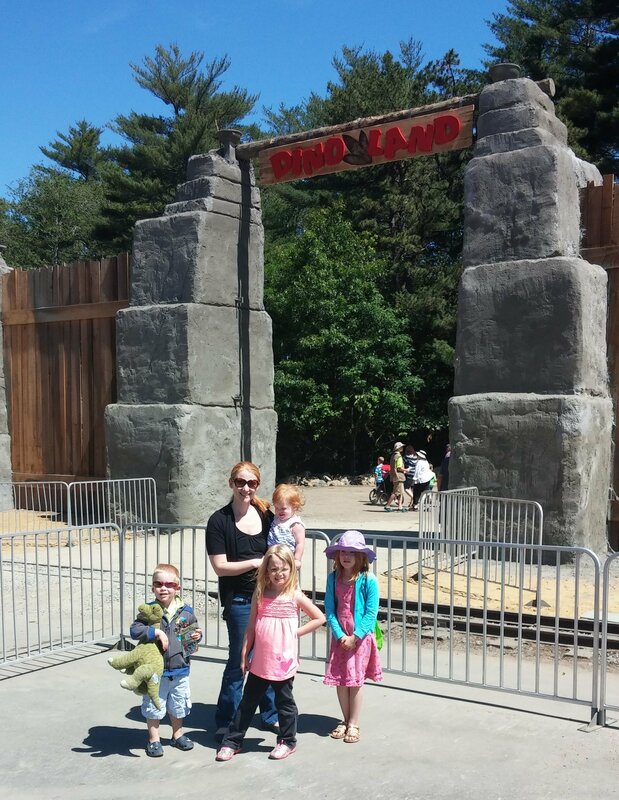 My children are ages 6, 5 and 4 and they loved each and every ride. The rides were very well maintained and clean. 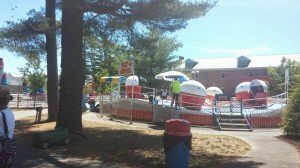 Below you will find pictures of a few of the kids’ favorite rides at Edaville. I think my favorite was the Tilt-a-Whirl. It’s been a while since I’ve been on a Tilt-a-Whirl and I forgot how much spinning was involved! 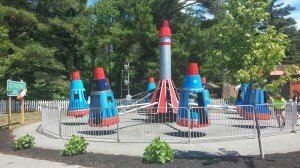 The park also had a few indoor play spaces that were great for little kids. Dinoland: The dinosaurs are loose in Edaville USA’s new Dinoland. In Dinoland you will be able to walk along a trail and view more than twenty dinosaurs. Along the way you’ll meet Edaville’s resident paleontologists who can tell you all about the dinosaurs. You can read my full review of Dinoland here. Food: The Food at Edaville was of good quality and priced average to other local attractions. 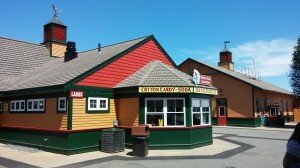 Below you will find your different dining and snack options while at Edaville. 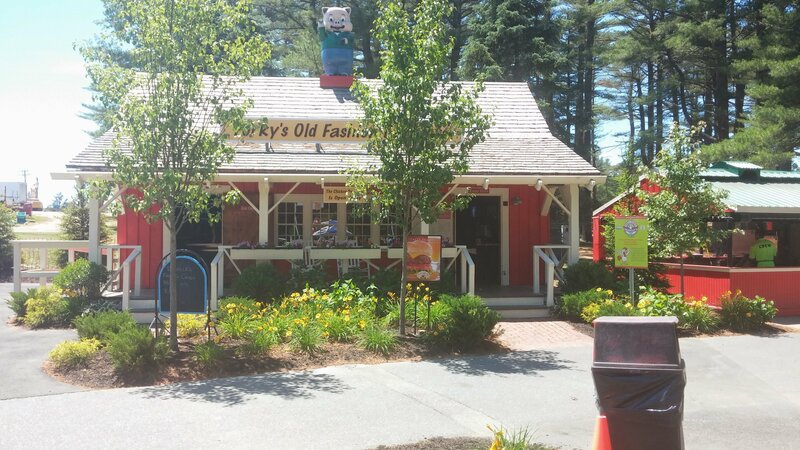 Porky’s Old Fashioned Barbeque. Full course barbecued chicken meals are available through Columbus Day at the Barbeque. Porky’s offers minimal indoor seating. 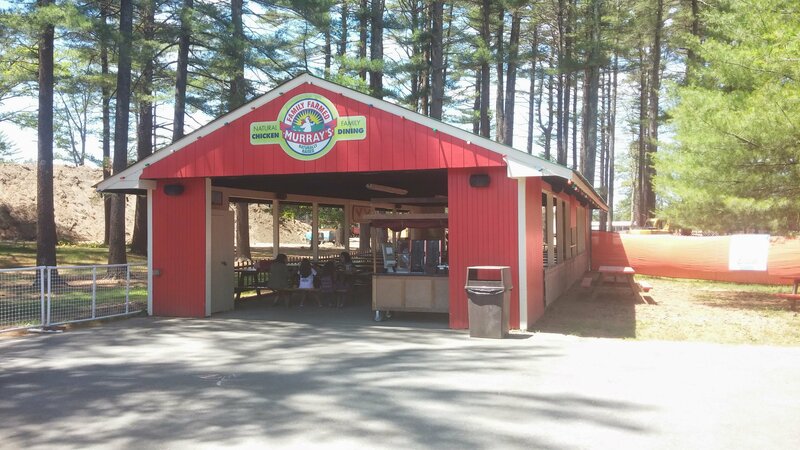 There is a large, covered outdoor eating area with picnic tables and benches. 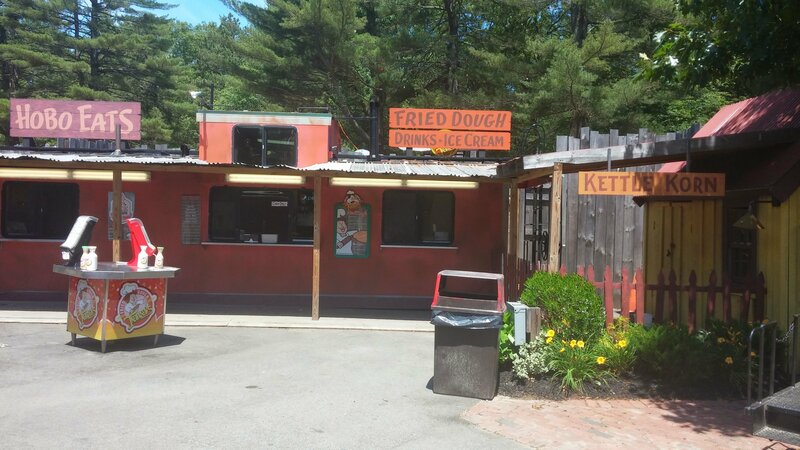 Hobo Eats: The Ice Cream Caboose serves ice cream, friend dough and beverages. It also serves hot chocolate and kettle corn during special events. There is outdoor seating available. KC’s Cafe: KC’s Cafe serves food, salads, sandwiches, pizza, hamburgers, hot dogs and hot and cold beverages. 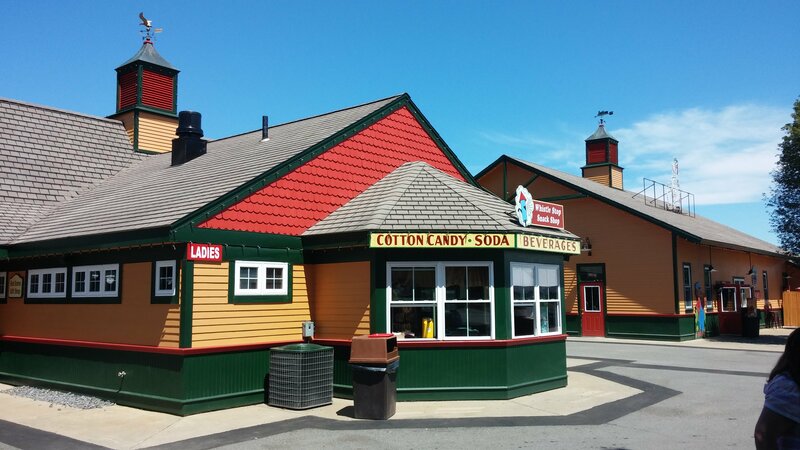 The Candy Depot: The Candy Depot right next to the platform and has an assortment of fun candies. 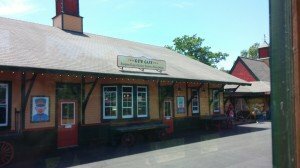 Whistle Stop Snacks: Whistle Stop Snacks is located adjacent to the platform and serves cotton candy, popcorn, beverages and more. 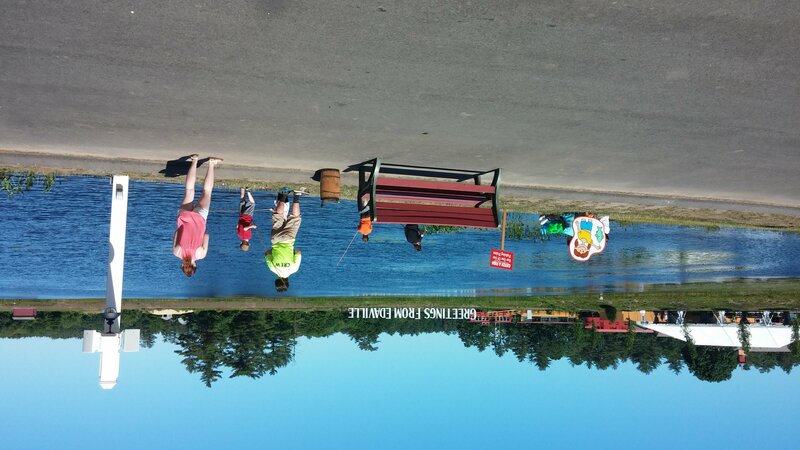 Fishing Pond: While at Edaville you can fish! Who knew? Well, actually, now you know. 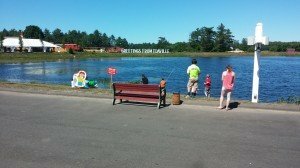 My family and I really enjoyed our time at Edaville and look forward to returning. I suggest following Edaville USA on Facebook. They are constantly running promotions and coupons to their facebook fans. For more information on Edaville you can visit their website at www.edaville.